We’re down to the final two! Check out today’s submission from Spencer DuMond of Holt – and don’t forget to RSVP for next week’s SoupGrant where we will vote on the winner! About the designer: I am a young Aspiring Graphic Artist, currently enrolled at LCC and have been practicing graphic design since the age of 13. I used to work for a digital printing company as their graphic designer but got laid off due to the economy, would love to have my logo as the new image of your company. About the submission: Inspiration came from the name alone. 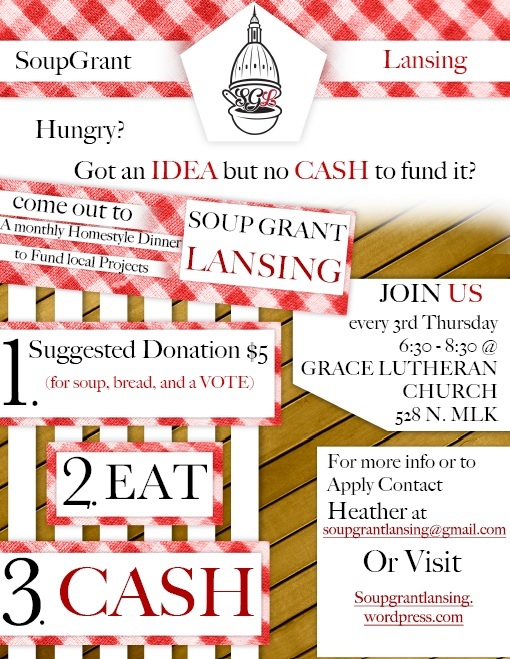 Soup Grant Lansing; I wanted a logo that captured every aspect of the name. For the type I wanted a Campbell’s soup style and also thought the type almost looks like hot steam rising from the soup and whats soup without a bowl and spoon. But lastly I wanted this logo to be obvious and proud about where it hails from, what city this company represents. What better way then include the BEAUTIFUL capitol that sits right in the middle of it all. Thank you for this opportunity. If you’d like to connect with Spencer, check out his Facebook page.